to a Genetics doctor for other reasons and she noticed her forehead was very narrow and then she felt the ridge. She immediately referred us to Dr. Muzaffar at the Universty of Missouri. We scheduled our appt. for a month later. When he came into the room he immediately said it had gotten worse since September with just looking at her. 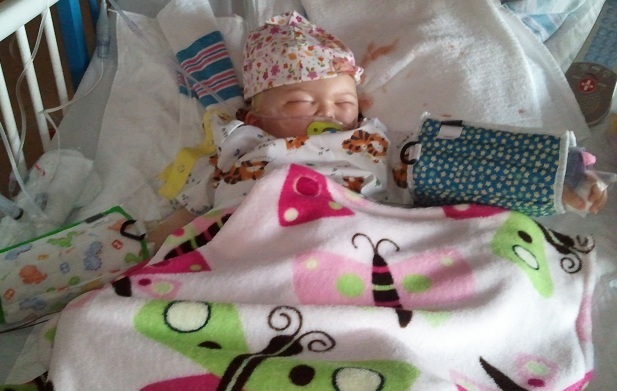 With the fact that she had been in heart failure at 2 months for a PDA at birth, we had to check with a cardiologist before any procedure could be done. We met with Dr. Carter here at University Children’s Hospital, all was good with her metal coil in her heart, but he noticed a small opening about 1 and a half mm in the wall of her heart. He informed us she would be fine for surgery, but will have to be checked again by 3 years. It may have to be repaired as well. 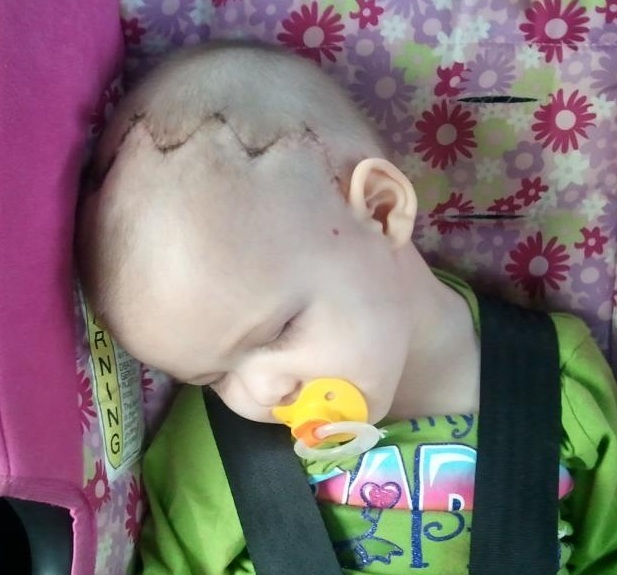 We got a sedated CT scan done on July 22nd and it confirmed our worst fears………metopic synostosis with trigonocephaly. They scheduled surgery for October 12th, 2011. The day arrived and they blocked the OR for 12 hours, but it only took 10. They had to cut into the membrane to relieve all the pressure that was built up and then stitched it back up. She had a complete CVR and front orbital. She spent 3 nights in PICU and on a Sunday she had no IV fluids and looked like it was time to go home. We brought Mercedes home on Sunday Oct. 16th and she was doing great. Monday and Tuesday came and went with no problems. Wednesday we noticed she had a fluid pocket develop on top of her head. We had a follow up the next day (Oct. 20th) with Dr. Muzaffar. He looked over her head and said to keep an eye on it, and that it should absorb into her body. Friday night I noticed it had gotten bigger so I called the on call Cranio doctor. He said to watch it and if it spread or she developed a fever to bring her in. Well, Saturday morning it burst open. I called him again, he said that was good and to watch for thickening of the drainage and fever. All was fine until Tuesday when she spiked a fever and the drainage got really thick. We went straight to the ER in Columbia, MO. They admitted her and ran some tests on the area in question. Wednesday around 11:30 am they came and took her back into surgery to clean out the infection, and ended up having to replace some hardware so her skin would close. The first surgery they had to really stretch her skin and so this time it was even harder. She was in surgery for 5 and a half hours this time. When she came out they had to continue her continuous antibiotics that they started earlier that morning. They had her on Vankamyacin that caused her to get “REDMANS”. That is where your head turns really red and itches and burns. If this happens they have to give you Benadryl before each round of Vankamyacin. We stayed in the hospital this time for 7 days. We came home on Nov. 2nd with IV antibiotics. She will be on them for about 2 weeks if not longer. After she will be on oral antibiotics for 2 more weeks. 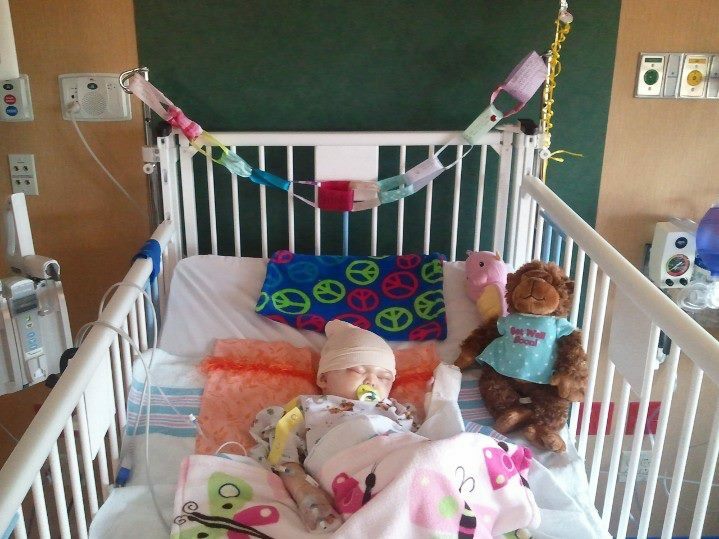 It turns out she had a respitory infection during her first surgery, but had absolutely no symptoms that morning. At least that is what the cultures showed. She did have a virus the week in between surgeries so that is why we are sure she had it in her system, but had no symptoms. She has a long road ahead of her, but she is strong and she will be just fine. She is improving day by day. This whole experience has been a test of our faith, but it proved to be wonderful. We have had a lot of support from family, friends and thanks to these wonderful sites people I have never met before. I can honestly say that without Cranio Care Bears and Shelby and Summer, and all the other websites and people who have helped me I would not have been able to deal with it all as well as I have. 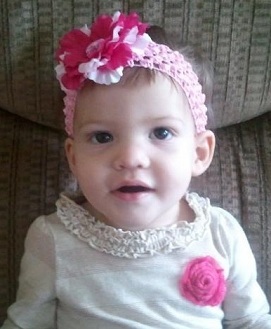 I want to thank Cranio Care Bears for posting her story!!!!! Also for the wonderful care package!!! !